This is the combination of chelated form of Iron with vitamins and trace elements especially formulated for enhanced iron absorption without GI side effects. This supplement designed for anemic people who are suffering from Iron deficiency and as the primary dietary supplement for all types of consumers. Especially women of childbearing age should maintain adequate levels of iron and nutrients either through diet or supplements to be used in pregnancy. Most of the body's iron is found in hemoglobin, the oxygen-carrying molecule in red blood cells. Smaller amounts are found in the tissues as myoglobin and as cofactors for many enzymes. Because of its central role in the hemoglobin molecule, iron is essential for formation of red blood cells. An iron deficiency can manifest as weakness, fatigue, and shortness of breath on exertion, dizziness, tinnitus, and spots before the eyes, drowsiness, irritability, infrequent menstruation, and loss of libido. For those consumers who are anaemic especially women's and not able to take a balanced diet with recommended serving of fruits and vegetables due to their hectic life style and untimely food habits and not eating enough foods. These nutrients are needed by the body for the formation of red blood cells. If the body does not receive adequate amounts of these nutrients, anemia can develop. This combination is useful in anemia caused by low levels of iron or folate in the blood. It is also used in pregnancy for the prevention and treatment of low blood levels of iron and to supply folic acid to the body. The human body needs to generate a steady supply of new red blood cells to replace old and damaged ones. To do this, it is essential to receive adequate amounts of particular nutrients in the diet, especially iron, vitamin B12, vitamin B2, folic acid, copper and manganese. The rational use of this nutritional supplement, combined with a healthy diet, will contribute substantially to health promotion and work in balance and synergism on protection and integration of the physiological functions of the body. Ferrous bisglycinate consists of one molecule of ferrous iron bound to two molecules of glycine. 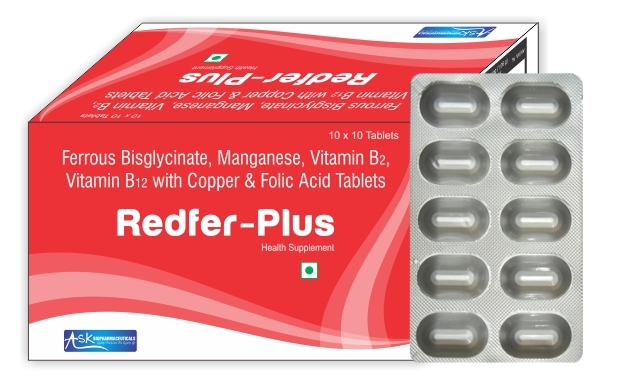 Ferrous bisglycinate enjoys the privilege of being a highly absorbable iron supplement exceeding ferrous salts Low dose of ferrous bisglycinate, may be equivalent to a higher dose of ferrous salt with regard to hematological and iron status when used by expectant women. This finding is important for the prevention of iron deficiency and iron deficiency anemia that often coincides with pregnancy. Iron is critical to human life. It plays the central role in the hemoglobin molecule of our red blood cells (RBCs), where it functions in transporting oxygen from the lungs to the body's tissues. It also functions in several key enzymes in energy production and metabolism, including DNA synthesis. High bioavailability even in presence of phytates, tannates, oxalates etc. Manganese is an essential trace mineral that is required in small amounts to manufacture enzymes necessary for the metabolism of proteins and fats. It also supports the immune system and blood-sugar balance and is involved in the production of cellular energy, reproduction, and bone growth. Manganese works with vitamin K to support normal blood clotting. Working with the B-complex vitamins, manganese helps promote a positive outlook when faced with stress, frustration, and anxiety. Iron and manganese work closely together, and a strong inverse relationship between deficiency in iron and high manganese levels has been found. While overly high manganese can contribute to anemia, manganese also helps the body use and store iron to some degree as well, which can help prevent anemia (low iron). It is essential for proper iron metabolism and so helps prevent anemia. It is required by the body to use oxygen and in the metabolism of amino acids, fatty acids, and carbohydrates. Riboflavin is further needed to activate vitamin B6 (pyridoxine), helps to create niacin and assists the adrenal gland. It may be used for red blood cell formation, antibody production, cell respiration, and growth. Vitamin B2 is responsible for maintaining healthy blood cells, helping to boost energy levels, facilitating in a healthy metabolism, preventing free radical damage, contributing to growth, protecting skin and eye health, and even more. It is used for red blood cell formation, antibody production, cell respiration, and growth. Copper is a mineral and also needed in relatively small amounts. Copper is required in the formation of hemoglobin, red blood cells as well as bones, while it helps with the formation of elastin as well as collagen - making it necessary for wound healing. It is needed to absorb and utilize iron. The influence of copper upon health is due to the fact that it is part of enzymes, which are proteins that help biochemical reactions occur in all cells. Copper is involved in the absorption, storage, and metabolism of iron. The symptoms of a copper deficiency are similar to iron-deficiency anemia. Copper may be absorbed by both the stomach and small-intestinal mucosa, with most absorbed by the small intestine. Copper is found in the blood bound to proteins. It is required in the formation of hemoglobin, red blood cells as well as bones. Folic acid is most important for rapidly growing tissues, such as those of a fetus, and rapidly regenerating cells, like red blood cells and immune cells. Folic acid deficiency results in an anemia that responds quickly to folic acid supplements. The need for folic acid increases considerably during pregnancy. Deficiencies of folic acid during pregnancy are associated with low birth weight and an increased incidence of neural tube defects in infants. It is important for healthy cell division and replication also required for protein metabolism and in treating anemia. Vitamin B12 is commonly known as Cyanocobalamin. Vitamin B12 is the "generic descriptor" name for any of such vitamers of vitamin B12. Because the body can convert cyanocobalamin to any one of the active vitamin B12 compounds, by definition this makes cyanocobalamin itself a form (or vitamer) of B12. Vitamin B12 helps in the production of healthy red blood cells that carry oxygen around the body. It works with folate to make nucleic acids. Part of its structure is cobalt and it needs intrinsic factor in order to work. Part of coenzymes for blood formation and required for nerve functioning and for homocysteine breakdown. Also, a vitamin B12 benefit is its ability to help in healthy regulation of the nervous system, including reducing such mood disorders as depression and anxiety. It is required for the formation blood and for the normal functioning of brain and nervous system. Pregnant and lactating mothers should not take any single supplement in higher - than - normal doses unless recommended by a health - care provider for special conditions. The combination should only be used in pregnancy and lactation if benefits outweigh the risk.